Anda and Kir out on the edge with the big view. 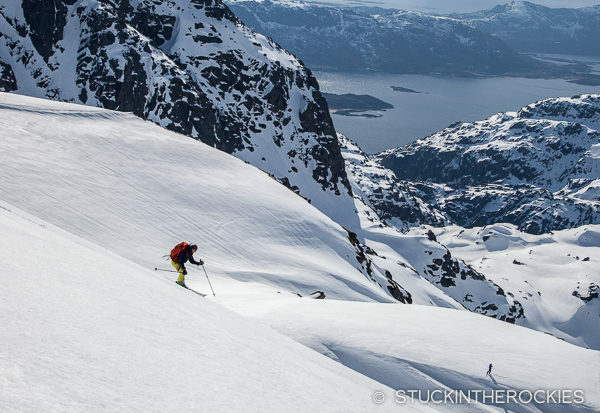 Snowy mountains that rise out of the fjord, ski lines that go all the way to the water, boat-accessed terrain, endless daylight, expensive beer– when you ask a skier to define Norway those are a few of the thoughts you often hear. And they all sound pretty enticing, well, with the exception of the last one. 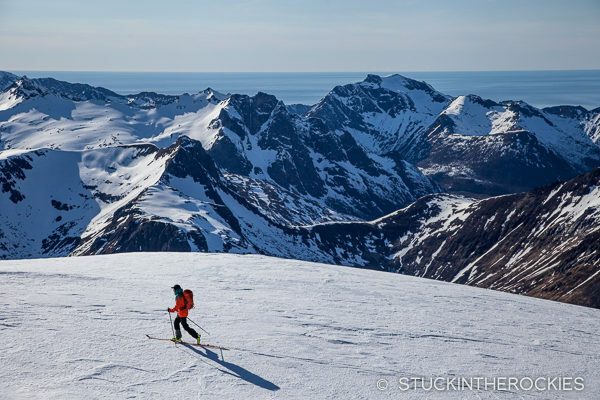 Rich in ski history and culture, and situated in an arctic environment with some of the most stunning backdrops and scenery a skier can find, it’s no wonder Norway has been gaining in popularity as a destination for US backcountry skiers. It’s been on our radar for some time and we decided this was the year. 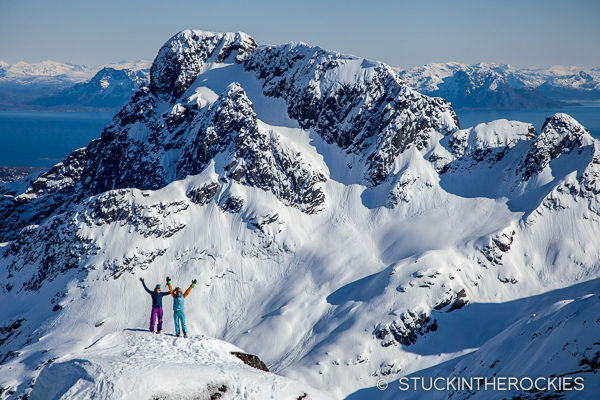 After doing a little research on locations and collecting beta on itineraries from friends who had been there, two things quickly became clear— there was more to do than there was time for, and we had a lot of friends who were also interested in skiing there this spring. By mid-winter, eight of us, all friends from Aspen, had committed to the dates and we began laying out the calendar. 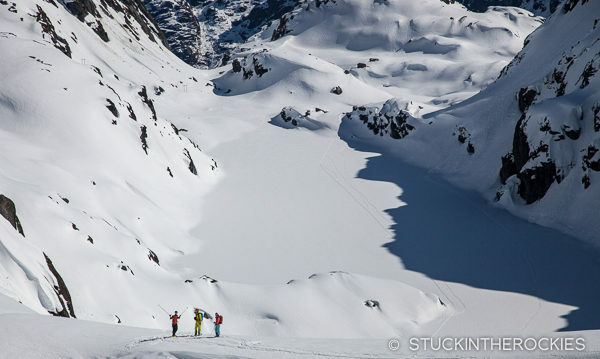 We planned to take two weeks to see and ski as much as we could. 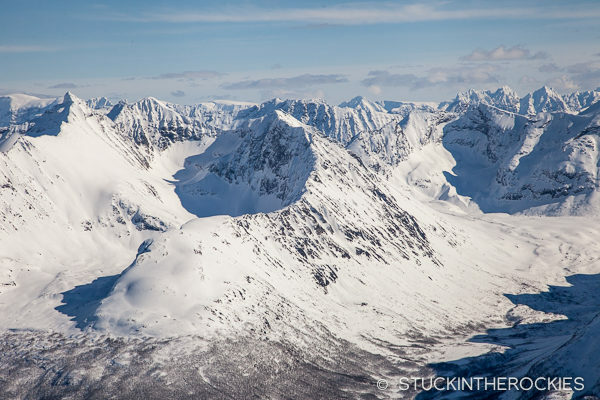 We laid out a plan to explore four different zones in Northern Norway, each for a few days. 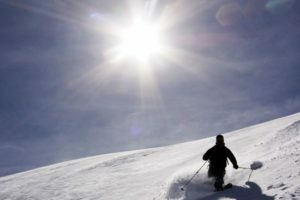 If the weather was good we could have 11 days on the snow, which would barely scratch the surface for what the country had to offer, but it would certainly make for a pretty good trip. Tromsdalstinden as seen from downtown Tromso. Four flights took us from Aspen to Frankfurt to Oslo and ultimately to Tromso, a small city at 69 degrees north, above the Arctic Circle. From the bag carousel at the airport we could see skiable peaks on the outskirts of the city. 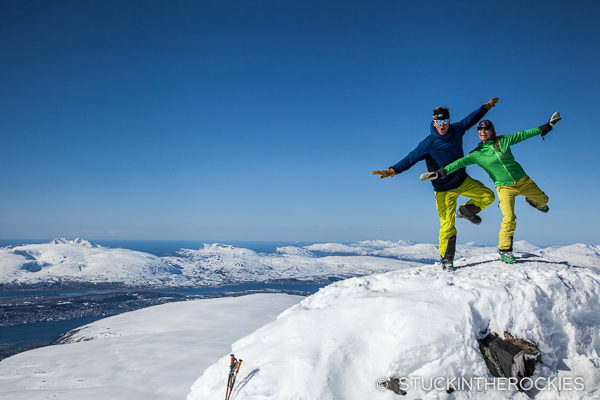 After checking into a hotel and finally getting some sleep, we woke up to a sunny day and headed out for our first tour, to a peak called Tromsdalstinden. 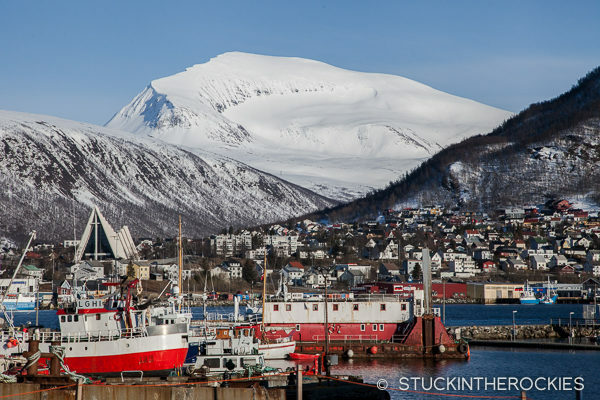 In addition to being able to see this peak from downtown Tromso, we were armed with a few backcountry ski guidebooks, all loaded with photos and conveniently written in English. 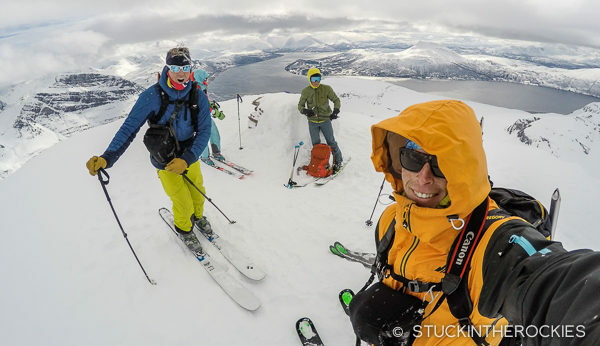 These guidebooks— we had one for Norway in general, one for the Tromso area, and one specifically for the Lyngen Alps— were a huge help and we recommend them if you’re planning to ski in the area. We were able to order a few of them before we departed and bought the others, along with several maps, at a bookstore in Tromso. 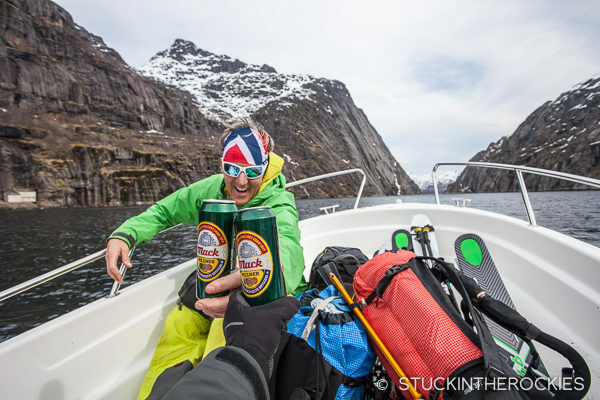 Our first day skiing in Norway, if this was any indicator it was going to be a good trip. 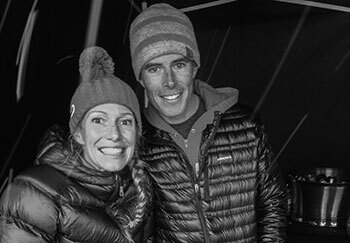 Penn and Christy on the summit block, happy to be here. This peak is 1238 meters tall, kind of average for the area. In feet that’s just over 4000 so we weren’t going to be suffering from the altitude at all, but since the peaks start close to sea level they still require full-sized efforts. Tromsdalstinden was a perfect introduction. 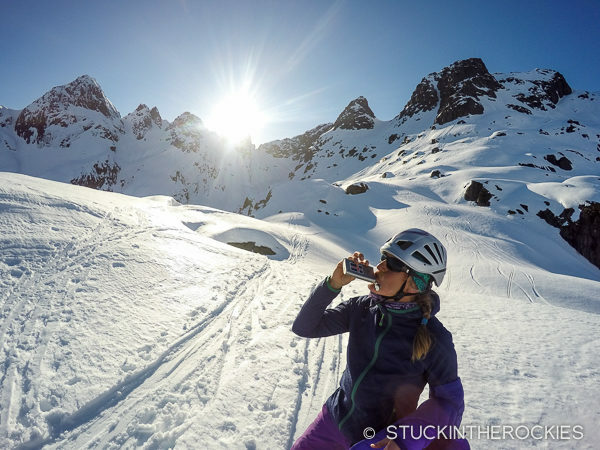 All we sought for the day was a post-travel ski tour to help clean out the cobwebs and get us thinking about the days ahead. The trailhead was just a few minutes drive from town and a quick approach that began with a track groomed for nordic skiers lead us right to the base of the mountain. The day was beautiful, and we were on a summit within 24 hours of arriving here. We were off to a good start. 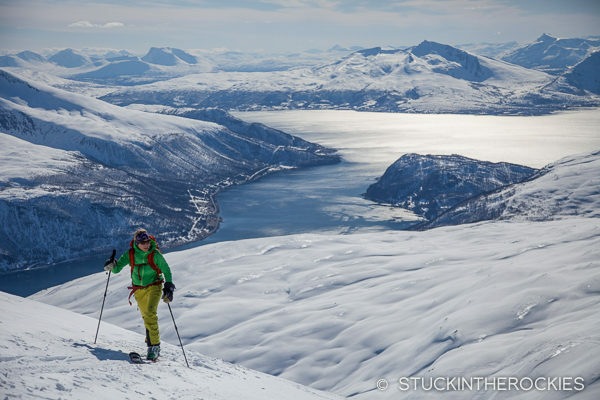 Skiing back down to the car, and Tromso, and into the rest of the trip. 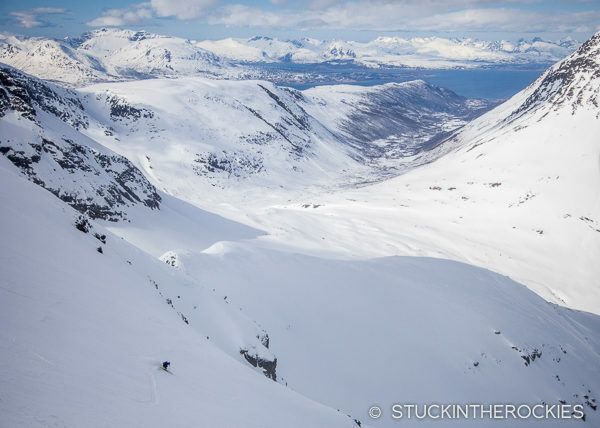 A view towards the Lyngen Alps region where we would be the following week. That evening our other friends arrived and with our full group assembled, we could get on with the itinerary. 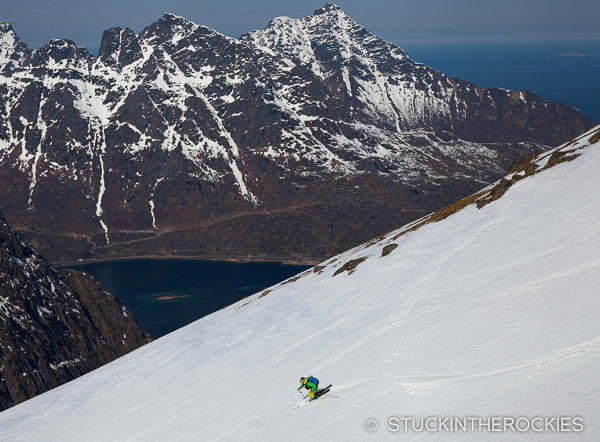 Our first destination was a hut down in the Lofoten Islands that required a sizable drive south. 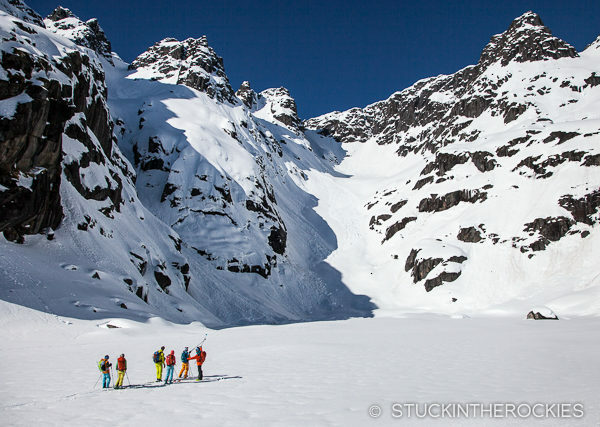 We didn’t want to pass up a potential ski day entirely in the car though, so we found a peak on the map along the driving route called Andersdaltinden. 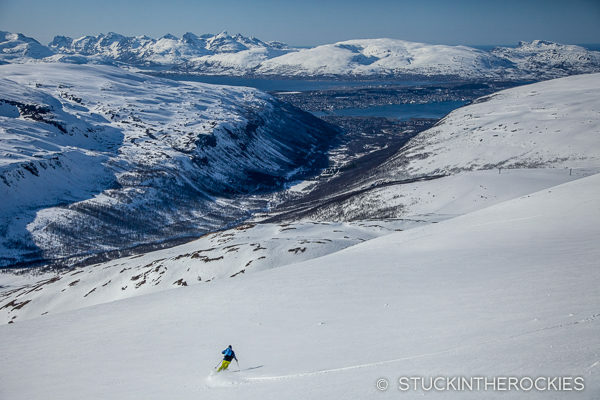 Shortly after departing Tromso in our rental cars the following morning, we pulled off to the shoulder at this roadside peak and went skiing. Christy and Kir flush some reindeer out of the trees. It was a bit steeper up on this peak compared to the one the day before. On the summit, 1221m. The watery backdrop was a fixture throughout the trip, it was part of the view from every single summit we stood atop. 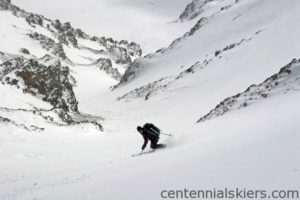 Fun terrain, good snow, good pitch, still a bit wintry. 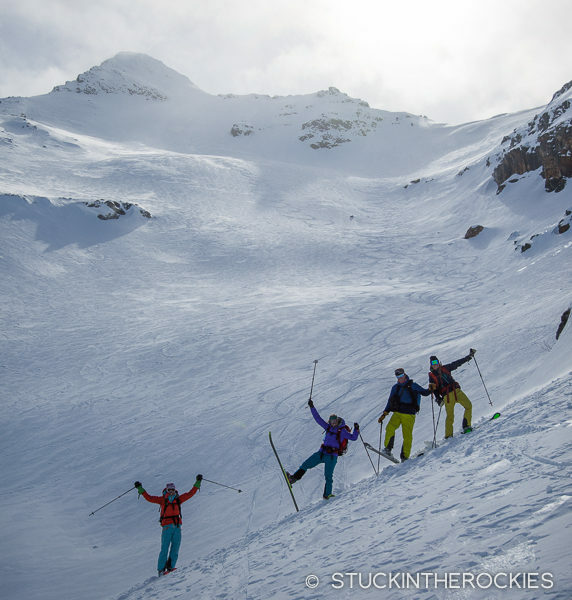 Happy skiers after skiing the mountain’s north side. Time to hit the road towards Lofoten. Troll Hut here we come! 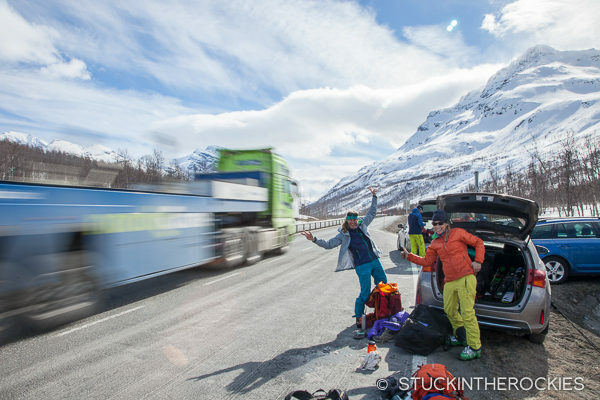 Anda and Christy getting changed right on the side of the road. 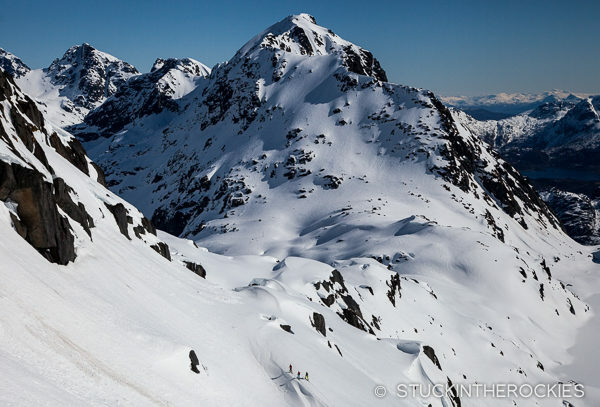 Access and approaches were usually very direct and pleasantly smooth, usually starting on skis right from the car. The summit is to the top right of the photo. Two peaks, two days, so far so good. 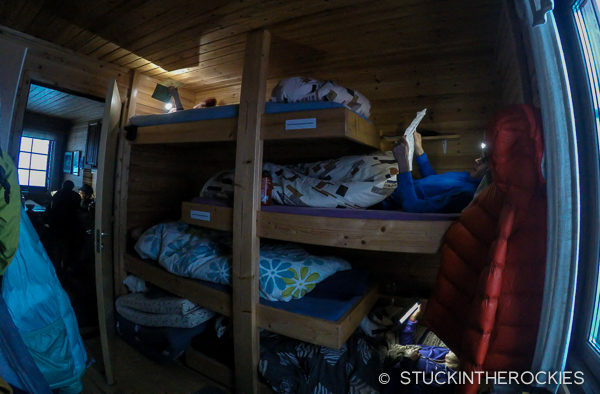 After skiing Andersdalstinden, we continued to make our way south and on the morning of the third day we were all set to head in to the Troll Hut, or Trollfjordhytte as it’s called locally. 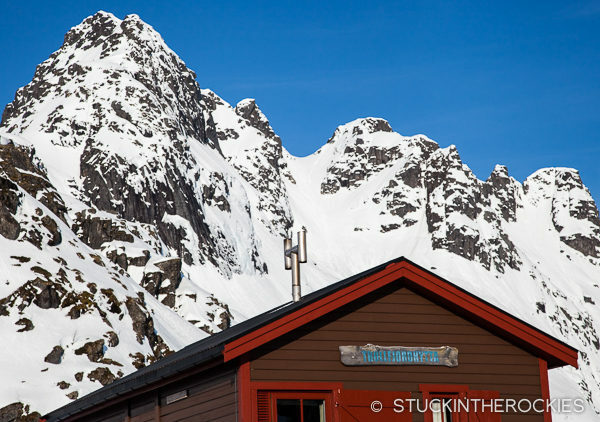 As the name implies, the hytte (hut) is in the mountains above the Troll Fjord, which we accessed by boat. To a bunch of land-locked Coloradans a boat ferry is a pretty novel approach to any backcountry adventure. We put our PFDs on, pulled our cameras out, and were off. 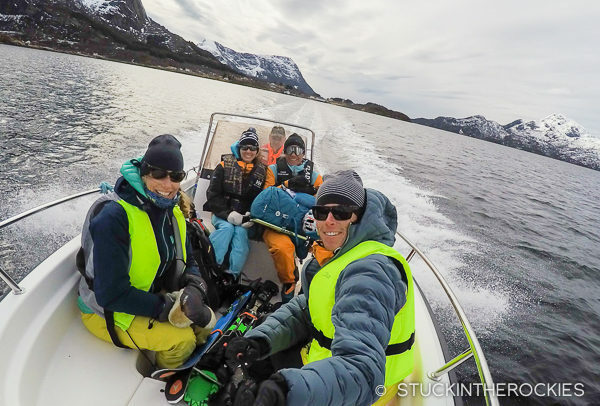 Christy, Jessie, Hilmar, Max, and I heading in to the Troll Fjord. Max had arranged the boat in advance, a modest sized local craft skippered by Hilmar from the small town of Digermun (pop. 125). 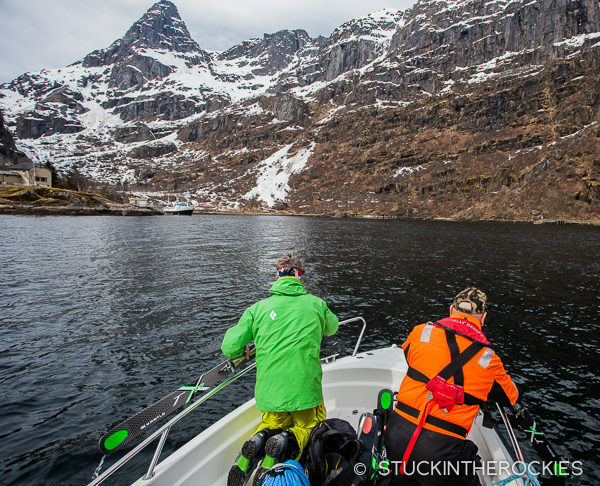 He ferried us, four at a time across the bay and into the Troll fjord, a 25-minute trip which was followed by a one hour skin to the cozy little hut. It’s advertised as sleeping 8-10 people, but its footprint would suggest a smaller group. Perhaps the trolls that frequent this area are of smaller stature. The surrounding mountains however, definitely do not qualify as small. 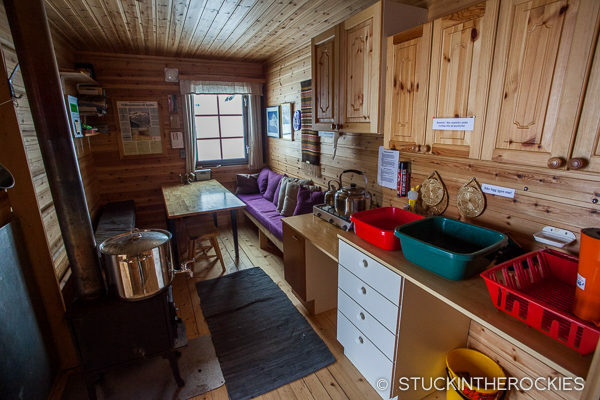 The common space and kitchen, it’s well designed, pretty compact, so it warms up quickly. There’s a sauna as well in a separate building, about 100 feet up the hill. Skiing at dusk the first afternoon there. You can see the hut on the knoll and adjacent sauna down in the valley below. The hut is part of the DNT system (read more about it here) and we made arrangements, though loosely, in advance. The DNT system has about 500 different huts and is a bit different than the US based huts. Payment is often on the honor system via a little lock box in the hut itself, and you can’t always make reservations to guarantee the place to yourselves. In some cases an actual skeleton key has to be obtained in the nearby village just to be able to get in the front door, other times it’s just left unlocked. Assessing the options on a frozen lake the morning of the second day. When it made sense we broke up into smaller groups. Another nice day, the locals told us nice weather is rare in Norway. We’ll just have to take their words on that. Options, options. You can see the hut near the top of the photo. Pete, Penn, and Kir head north. 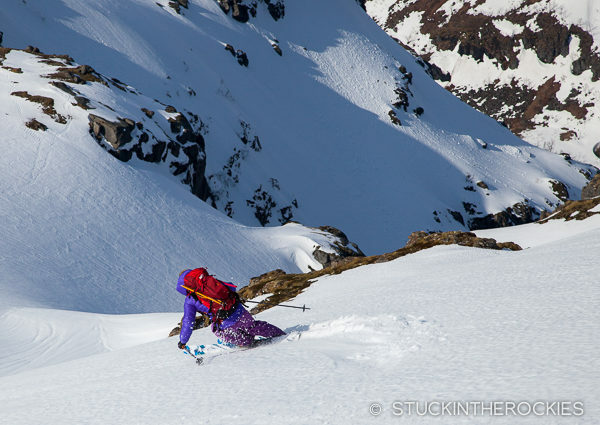 Anda skiing off an unnamed flat summit/lunch spot we dubbed “Trolltinden”. From here we skinned up the peak in the background. Pete nearing the summit of another unnamed peak indicated on the map only by its elevation, 875 meters. 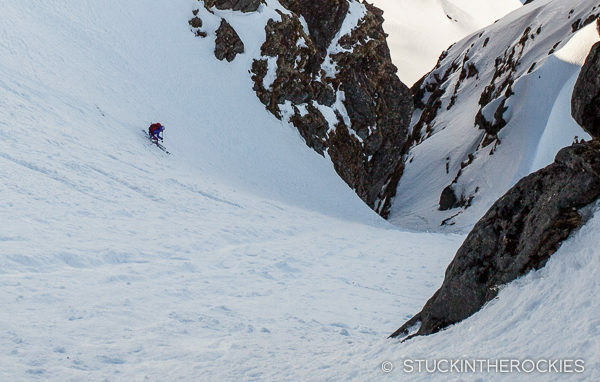 Anda and I skied down a couloir from the 975m summit. The surface was pretty stiff but the terrain was fun. 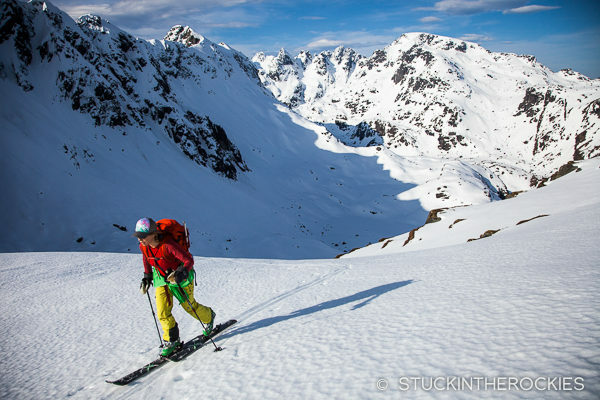 Anda, out of the couloir and loving being out here. Time for some borovnicevec! Christy and Anda after a pretty big ski day. Slushie anyone?? Our room for four, almost navy style. Since we were so far north, this was about as dark as it got the entire trip. The eight of us settled into the hut for two nights and three days and toured around surrounding mountains until Hilmar was set to pick us up. 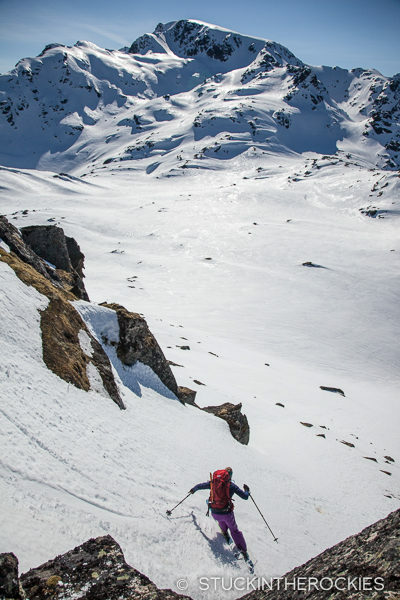 The terrain is steep and the peaks rugged, and since our timing seemed to coincide with the arrival of spring, we had to be a bit selective as to what and where we skied. 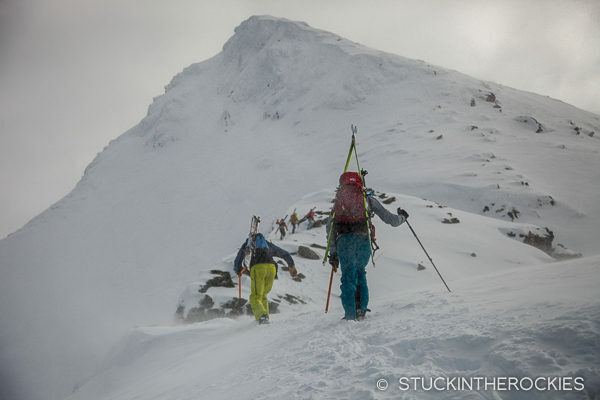 There was wet slide activity on the steeper slopes on nearly all aspects and the temperatures weren’t really getting below freezing, but that didn’t preclude us from getting in a lot of skiing because the Troll Hut has a lot to offer. 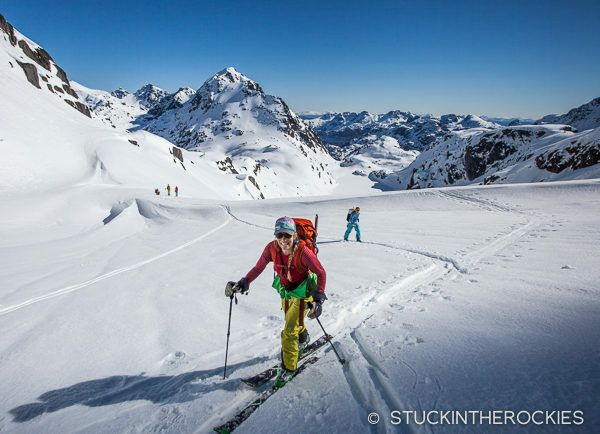 On the third morning Penn, Kir, Anda, Christy, and I headed to a summit Max and Jessie skied the day before. Just another day in lousy Norwegian weather for us. The south aspects like this one were in spring condition. 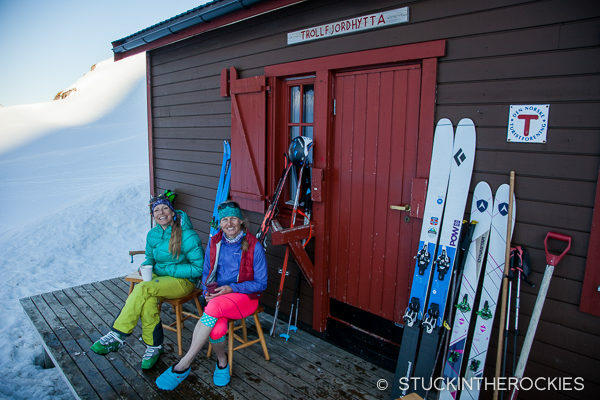 The Troll Hut was a cool experience and one that we would recommend to skiers visiting that part of the country. 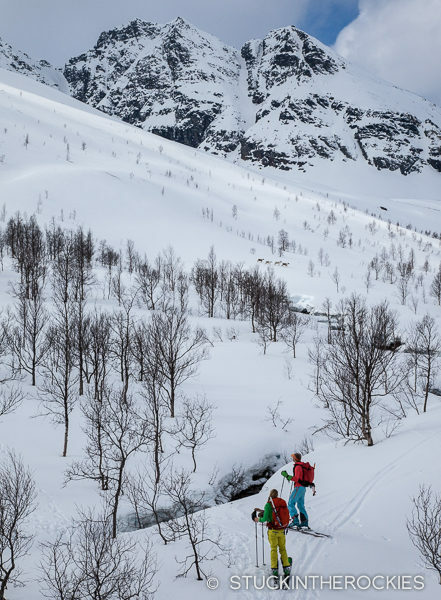 When it was time to go, we made our way down to the Trollfiord for our pickup and we encountered a group of seemingly seasoned Norwegian skiers heading up to the hut for the day and they said they believed the area to be one of the most beautiful places in the country. They were cruising the coast on a large boat and told us to hop on board and grab a few beers. Naturally we obliged. Skol! In the boat and off to the next spot. Or at least we hoped. And then we had an interesting ride home with Hilmar. 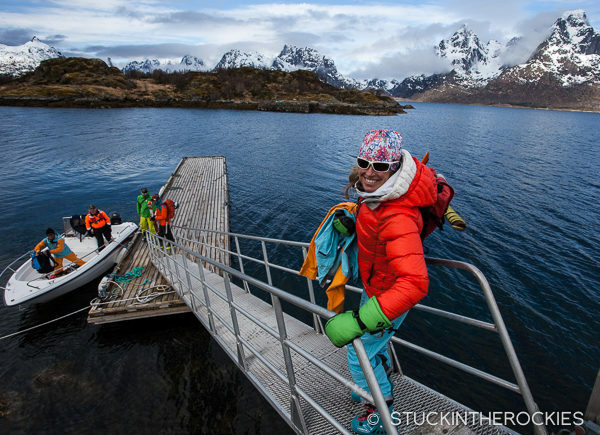 The engine stalled shortly after leaving the dock and some skis were employed to get us back to dock. Hilmar summoned Penn to, “Puddle, puddle!” Once back to dock the engine restarted and we cruised back to Digermulen. After the short delay we made it back to the mainland and we began the drive to the next area, Senja. Mount Edwards – 13,850 ft. 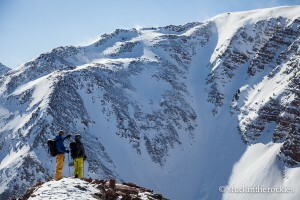 The south facing Edwardian Couloir on the 13er Mount Edwards make for a sweet backcountry ski in the Front Range mountains of Colorado. Awesome photos! I want to go back!!!! The place definitely warrants a return trip. Maybe several.